Are You Lonesome Tonight is a traditional pop song written by vaudevillians, Roy Turk and Lou Handman in 1926. Elvis Presley recorded and released a version in 1960. Music: C Major in 3/4 time at ~76 bpm. Spoken Verse: The second verse is spoken. Simply play the chords from the first verse over the second verse. If you listen to the video, the humming in the background keeps you in sync with the chords. 1. Are you lone-some ton-ight?__ Do you miss me to-night? Are you sor-ry we drif-ted a-part? When I kissed you and called you sweet-heart? ** Do the chairs in your par-lour___ Seem emp-ty and bare? Do you gaze at your door-step___ And pic-ture me there? ** Is your heart fil-led with pain?___ Shall I come back a-gain? Tell me dear, are you lone-some to-night? Elvis Presley chords and lyrics are property and copyright of their owners. 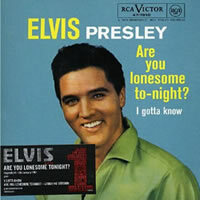 "Are You Lonesome Tonight" chords and lyrics are provided for educational purposes and personal use only.